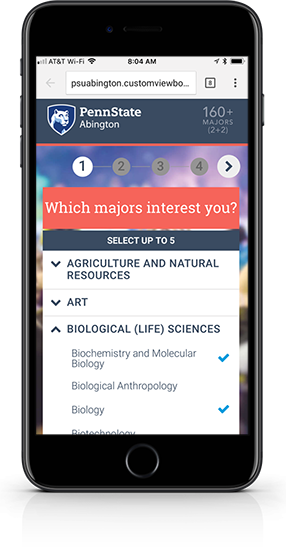 Make the college search experience immediate, personalized and adaptive to their interests. CustomViewbook prospects are 4.5X more likely to become enrolled. Capture valuable data and focus on best-fit prospects. 30% of prospect leads captured were new to the Rutgers prospect database, including a high percentage of out-of-state and international students. 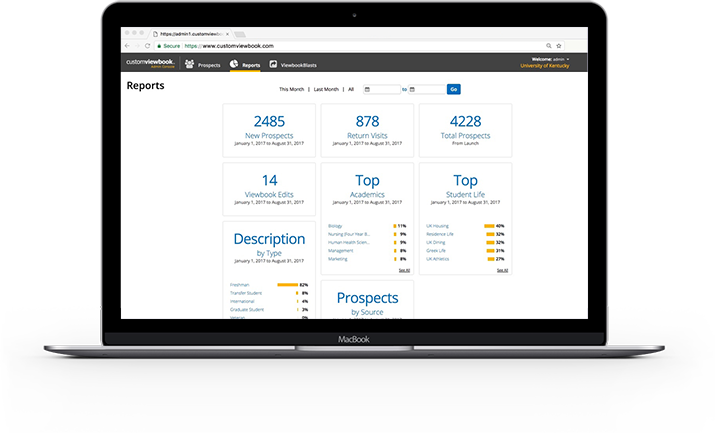 Based on student interests, CustomViewbook creates a rich profile of each prospect that can be imported directly into your CRM for targeted follow-up. customviewbook has helped Rutgers increase applications and student enrollment – and has also played a significant role in reducing print costs. For a generation that's immune to traditional strategies, CustomViewbook breaks through. How CustomViewbook™ works to capture qualified prospects. The college search experience GenZ prefers and the lead generation you need. 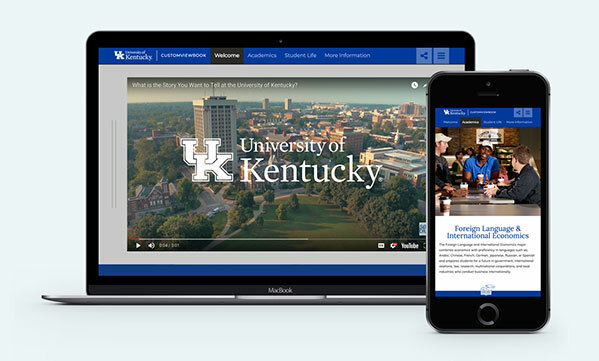 CustomViewbook empowers prospective students and recruiters. By putting prospects in control of the college search, you gain insights and highly qualified leads. Work with the CustomViewbook team to strategize and curate the content GenZ responds to. 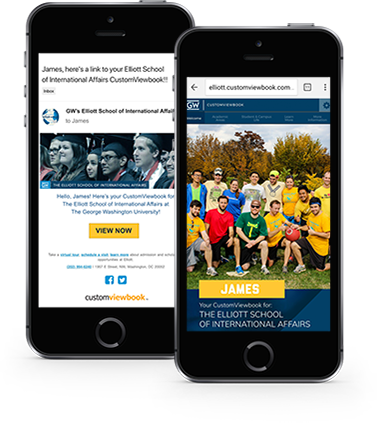 Prospects create their own CustomViewbook in just a few clicks, right from your website, right on their smartphone. Make their search more meaningful by giving prospects relevant info they can easily share. Capture prospect data and powerful insights to focus on best fit prospects. ViewbookBlasts sends personalized viewbook links to thousands of leads at once. With easy to create templates and a simple mail merge, you can create and send personalized viewbooks that engage prospects and net highly qualified leads. 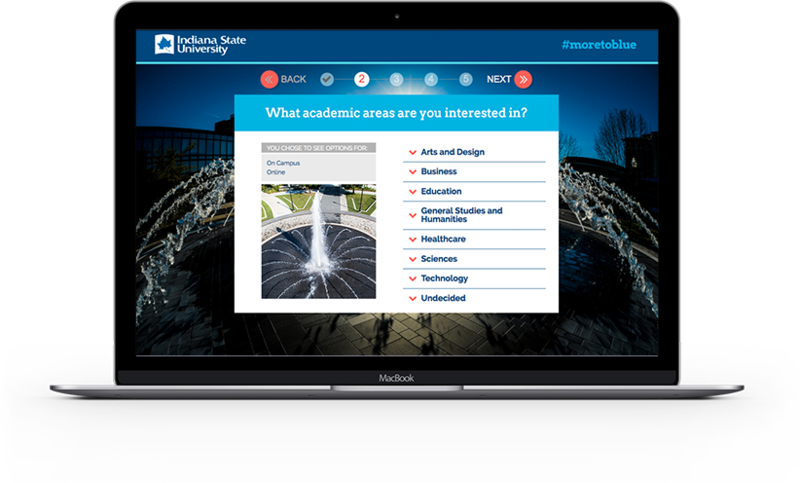 Create a Viewbook template in seconds, based on Academic, Student Life, and Campus areas of interest you want to promote. Upload targeted student prospect leads as a CSV file from your database or CRM into ViewbookBlasts. First and last names and email addresses are all that’s needed to regenerate a new CSV file with unique personalized URLs. Using this new CSV file, merge and blast out from your CRM. Each prospect receives your email message featuring a link to their own CustomViewbook, already personalized with their name on the cover. As prospects access their CustomViewbook, their activities and new selections are captured. Your now highly-qualified leads can be merged back into your CRM to make follow-up more effective. Recruiter App captures leads everywhere you go. Eliminate inquiry cards, manual entry and any lag time in student fulfillment. 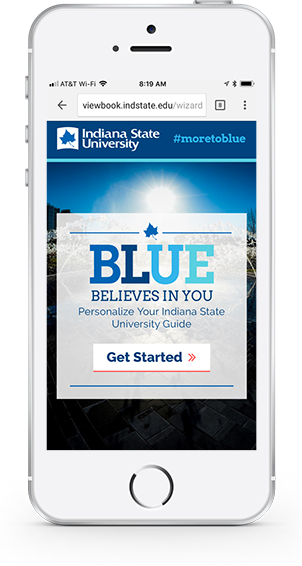 This native iPad app makes recruitment fairs, welcome centers and events more engaging and productive. GenZ prospects can quickly see and select info they want in their CustomViewbook. Real-time data sync captures prospect information instantly. At any location, Recruiter App can capture and store data offline. Data syncs automatically with your admin console to make follow-up seamless. Reporting & Results bring your prospects into focus. 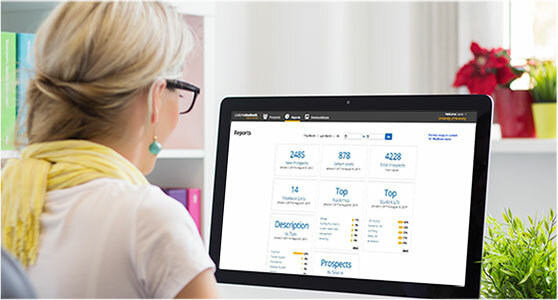 By capturing user data and automatically delivering qualified leads ready for import into your CRM, CustomViewbook provides valuable insights and saves time. CustomViewbook's intuitive "at-a-glance" Admin Console allows you to keep an eye on activity metrics, trends and more. Learn what your prospects seek to know, where they are and how they engage with their Viewbook. Prioritized by your GenZ prospect's level of interest and informed by their academic and student life choices, follow-up efforts become more productive for you and more relevant to their own college selection process. Full profiles are maintained and updated, including interests and preferences, location, graduating year and more. As they revisit and refine their selections, prospects move up in rankings, alerting you to their ongoing interest. CustomViewbook performance metrics reveal which aspects of Academics and Student Life are trending and when your prospects are most engaged, helping guide your content strategy. 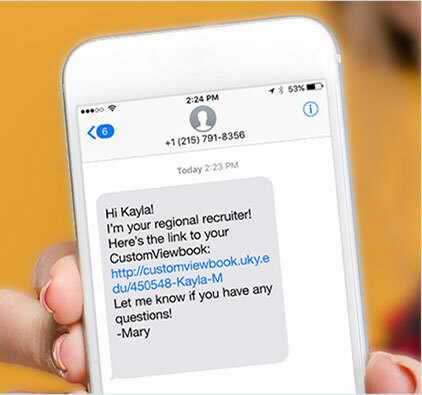 Using your existing SMS integration or adding Text Request, CustomViewbook makes it easy to send text messages - your prospect’s preferred means of contact for response and follow-up.